Preliminary Results of the Election to the Legislative Assembly of St.Petersburg. The campaign leading up to the Dec. 8 elections for the St. Petersburg Legislative Assembly, which both City Hall and the City Electoral Commission (CEC) have described as quiet, finally began to generate some noise this week. While the run up to Sunday's vote for St. Petersburg's Legislative Assembly has turned out politically to be just as loud as previous elections, a number of politicians are expressing concern that the response of the electorate has been largely apathetic. ST. PETERSBURG, Russia - Voters in St. Petersburg went to the polls Sunday to elect a new Legislative Assembly following a campaign marked by trickery and accusations of vote-buying. The "SPS+YABLOKO" bloc will succeed at the elections to St. Petersburg Legislative Assembly of the third convocation. Such a statement was made by deputy of the State Duma of the RF Boris Nemtsov at a press conference in the Rosbalt information agency. The leader of the Union of Right-Wing Forces (SPS) noted that he had come to St. Petersburg to support his comrades at the elections to the Legislative Assembly." " YABLOKO and SPS has created such a powerful coalition for the first time in Russia's history, and the victory of this bloc, which aims to make St. Petersburg a comfortable and European city, is important for all democrats," added Nemtsov. However, at present, noted Nemtsov, we are "observing a tough election campaign where the rules are not respected." 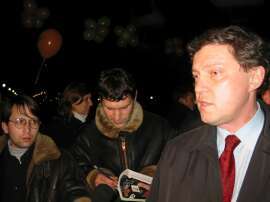 On November 30, 2002 Grigory Yavlinsky commented in a speech at an international conference "The Big Europe", held in Vilnius, Lithuania, on the problems of establishing new relations between Russia, Europe and the USA, dictating the requirements related to the "creation of a new joint security agenda for Russia and Europe." "One of the key aspects today concerns the creation of a Russian-European anti-missile defence system for the theatre of military actions (RE AMD or AMD TMA)," said Yavlinsky. Interview with Alexei Arbatov, deputy chairman of the Duma defense committee. The Moscow police breaks up small demonstration by YABLOKO activists against the amendments to the law on the mass media. Existing economic mechanisms only achieve the very narrow goal of maintaining the present The The Moscow police breaks up small demonstration by YABLOKO activists against the amendments to the law on the mass media. The Moscow Times, By Alla Startseva, November 22, 2002. The State Duma has voted to postpone until Dec. 18 the crucial second reading of a package of bills that would allow for a controversial restructuring of the energy sector. MOSCOW - The State Duma on Wednesday voted to postpone until Dec. 18 the crucial second reading of a package of bills that would allow for a controversial energy-sector restructuring. The Moscow Times, December 2, 2002. After failing to pass housing reform two days earlier, the State Duma mustered enough votes to pass a government-drafted bill to phase out subsidies for gas, electricity and water in the first reading Friday. The Moscow Times, By Alla Startseva, November 28, 2002. In a vote that took the Kremlin by surprise, the usually obedient State Duma on Wednesday narrowly rejected a government-drafted bill to reform the housing sector by phasing out subsidies for electricity, water and gas. St. Petersburg, November 27, 2002; 14:47. The co-chairmen of St. Petersburg branch of the electoral bloc "SPS+YABLOKO" forwarded a request to Public Prosecutor General V. Ustinov to adopt measures to restore the legitimate order for conducting election campaigns. The Moscow Times, By Andrei Zolotov Jr., November 26, 2002. Meeting with a select group of media managers, President Vladimir Putin announced Monday evening that he had heeded their plea and vetoed the restrictive amendments to the laws on media and terrorism. On November 29-30, Chairman of the Russian Democratic Party YABLOKO Grigory Yavlinsky will participate in an international conference "The Big Europe", Vilnius, Lithuania, devoted to contemporary security problems in Europe. Grigory Yavlinsky, leader of YABLOKO: "As the manipulation factor is very strong, nothing can be predicted." MOSCOW, Sept. 27 - Energy executives and government officials from Russia and the United Question: What is your overall political forecast for the next year, and for the upcoming fourth Duma elections? In a little over a year, the United States has done a startling diplomatic about-face on Russia, moving it from second-rate-power status to vital ally, thanks mostly to one thing: oil. MOSCOW, Sept. 27 - Energy executives and government officials from Russia and the United States will meet in Houston next week to discuss energy cooperation at a time when concerns over the safety of world oil supplies have been heightened by the Bush administration's push for We are observing a curious and paradoxical situation at the moment: President Putin has opened a dialogue with Yabloko leader Grigory Yavlinsky. Alexei Arbatov, member of the State Duma commission for reviewing federal budget expenditures allotted to defence and security issues of the Russian Federation, told us about the specifics of the formation of the "budget of war". The Expenditures Are Typical of War Rather Than an "Operation"